al-Jura is located in the west part of Gaza District, southwest of al-Majdal, north of al-Khisas, as shown on the map. Al Jourah/Asqalan located 15.5 miles NE of Gaza. Population: 2,420. Obliterated in 1948, with the Jewish settlements of Ashqelon and Afridar built on its 3,056 acres. 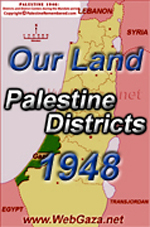 This entry was posted in Palestine 1948 and tagged al-Jura. Bookmark the permalink.